Ce document au format PDF 1.3 a été généré par PScript5.dll Version 5.2.2 / Acrobat Distiller 11.0 (Windows), et a été envoyé sur fichier-pdf.fr le 05/07/2018 à 18:43, depuis l'adresse IP 89.84.x.x. La présente page de téléchargement du fichier a été vue 287 fois. Taille du document: 12 Mo (6 pages). Revista Ibérica de Aracnología, nº 32 (30/06/2018): 87–92. Grupo Ibérico de Aracnología (S.E.A.). ISSN: 1576 - 9518. 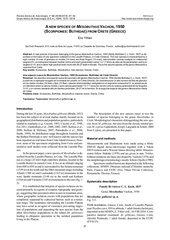 Key words: Scorpiones, Buthidae, Mesobuthus, new species, Greece, Crete. Palabras clave: Scorpiones, Buthidae, Mesobuthus, especie nueva, Grecia, Creta. Taxonomy / Taxonomía: Mesobuthus gallianoi sp. n.
been reported several times from Crete Island (Greece). However, none of the specimens originating from Crete and presented in such studies were collected from the Lassithi Plateau. (1564 m) and Varsami (1545 m) mountains to the east (fig. 12). 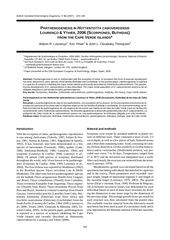 from Cyprus, are presented in this paper. the morphological terminology mostly follows Hjelle (1990). Fig. 1. Topographic map of Crete showing the Lassithi Plateau, where the new species was found. Fig. 2. Lassithi Plateau, Crete. Natural habitat of Mesobuthus gallianoi sp. n.
Fig. 3. Mesobuthus gallianoi sp. DESCRIPTION BASED ON FEMALE HOLOTYPE. posterior median carinae; eyes surrounded by black pigment. ventral side; base of aculeus reddish yellow, tip reddish black. some darker zones on the carinae of femur and patella. lateral aspect. I-K. Metasomal segment IV-V and telson, dorsal (I), ventral (J) and lateral (K) aspects. All scale bars 1 mm. the centre of carapace; median eyes separated by approximately one ocular diameter; three pairs of lateral eyes. median depression. Pectinal tooth count 26-27 in female holotype; three marginal lamellae and seven middle lamellae. side and smooth dorsally; aculeus long and moderately curved. Fig. 5. Mesobuthus gallianoi sp. n., female holotype, alive. Fig. 6. Mesobuthus gibbosus, female from Greece, alive. female holotype. Total length including telson, 51.0. Carapace: length, 5.4; anterior width, 3.0; posterior width, 5.9. (Scorpiones: Buthidae) on the island of Rhodes - hybridization between Ulysses’ stowaways and native scorpions? Molecular ecology, 11: 925-938. GANTENBEIN B., C. KROPF, C. R. LARGIADÈR &amp; A. SCHOLL 2000. Cyprus. Revue Suisse de Zoologie, 107(1): 213-232. (Scorpiones: Buthidae) from Eurasia. 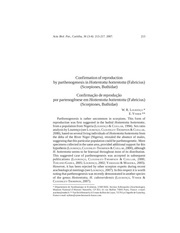 Journal of Arachnology, 31(3): 413-421. HJELLE J. T. 1990. Anatomy and morphology. In: Polis GA (Ed). The Biology of Scorpions. Stanford University Press, Stanford, 9-63. (Scorpiones: Buthidae). Euscorpius, 44: 1-8. C. LOUIS &amp; M. MYLONAS 2006. 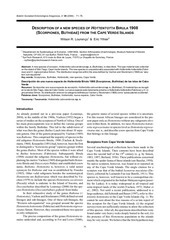 Evolution of Mesobuthus gibbosus (Brullé, 1832) (Scorpiones: Buthidae) in the northeastern Mediterranean region. Molecular ecology, 15(10): 28832894. STAHNKE H. L. 1970. Scorpion nomenclature and mensuration. Entomological News Philadelphia, 81: 297-316.
national d’Histoire naturelle, Paris, 3è sér., 140 (104): 857958. 4.9, width, 2.2; chela length, 9.1, width, 2.0, depth, 1.9; movable finger length, 5.9. 13) on movable finger and 11 rows on fixed finger in M.
gibbosus, 12 rows on both movable and fixed fingers in M.
pectinal tooth count with 26-27 teeth in female (20-23 and 2027 teeth in females of M. cyprius and M. gibbosus, respectively). Zoologie, Paris, 3 (1): 57-60. 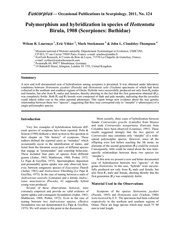 Mesobuthus in the Near East based on ecological data (Scorpiones: Buthidae). Biologia Gallo-Helenica, 20(1): 69-74. Società entomologica italiana, 130 (1): 3-12. Ce fichier a été mis en ligne par un utilisateur du site. Identifiant unique du document: 01882662.